Please join us as we welcome author Peter Swanson to the Nevins Library! His most recent thriller is Her Every Fear. Growing up, Kate Priddy was always a bit neurotic, experiencing momentary bouts of anxiety that exploded into full-blown panic attacks after an ex-boyfriend kidnapped her and nearly ended her life. When Corbin Dell, a distant cousin in Boston, suggests the two temporarily swap apartments, Kate, an art student in London, agrees, hoping that time away in a new place will help her overcome the recent wreckage of her life. Soon after her arrival at Corbin’s grand apartment on Beacon Hill, Kate makes a shocking discovery: his next-door neighbor, a young woman named Audrey Marshall, has been murdered. When the police question her about Corbin, a shaken Kate has few answers, and many questions of her own — curiosity that intensifies when she meets Alan Cherney, a handsome, quiet tenant who lives across the courtyard, in the apartment facing Audrey’s. Alan saw Corbin surreptitiously come and go from Audrey’s place, yet he’s denied knowing her. Then, Kate runs into a tearful man claiming to be the dead woman’s old boyfriend, who insists Corbin did the deed the night that he left for London. When she reaches out to her cousin, he proclaims his innocence and calms her nerves — until she comes across disturbing objects hidden in the apartment and accidentally learns that Corbin is not where he says he is. Could Corbin be a killer? What about Alan? Kate finds herself drawn to this appealing man who seems so sincere, yet she isn’t sure. Jet-lagged and emotionally unstable, her imagination full of dark images caused by the terror of her past, Kate can barely trust herself, so how could she take the chance on a stranger she’s just met? Come and meet Peter Swanson, and listen as he reads from the book and talks a bit about it. To register for this program, click here. 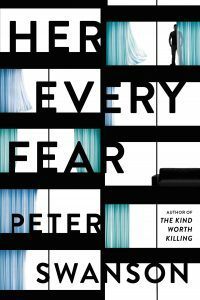 Categories: Author Visit, Books, Thriller | Tags: Author Visit, Her Every Fear, Peter Swanson, Thriller | Permalink.